For the modern subdivision of Ukraine, see Administrative divisions of Ukraine. For a modern political party in Ukraine and its parliamentary faction called "Regions of Ukraine", see Party of Regions. A list of the various regions of Ukraine and/or inhabited by Ukrainians and their ancestors throughout history. The traditional names of the regions of Ukraine are important geographic, historical, and ethnographic identifiers. Western Ukraine may mean either the historic region of Galicia, or may also include Volhynia, Podolia, Transcarpathia, and/or Bukovina. Eastern Ukraine may mean either the Don basin, Sloboda Ukraine, continental Taurida regions etc. South Ukraine often includes the whole Taurida, the Kryvyi Rih basin, and the regions of Mykolayiv and Odessa oblasts. Alternatively it may include the Don basin, in particularly the adjacent land to the Azov Sea. Central Ukraine, a more vague term, often denotes what is not included in Western or South-Eastern definitions. 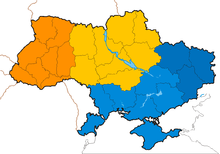 Other terms are rarely used - such as "South-West Ukraine", which can denote either Transcarpathia, or Budjak. Sometimes the term "South-Eastern Ukraine" is used to define both regions of the Southern and Eastern Ukraine. Due to the shape of the country, in narrow definition, term "Northern Ukraine" is often used to denote either the bulge of Chernihiv/Sumy Oblasts or, in broader terms, the whole of Polesia. "North-western Ukraine" almost exclusively refers to the historic region of Volhynia. This makes the term "North-Eastern Ukraine" rarest of them all - it is either used as synonym for the narrow definition of Northern Ukraine, or as synonym for Sloboda Ukraine (particularly the Sumy Oblast).